Why accept reality in cinema? When the so called “Classical Cinema” emerged in the 1930s, the rules were simple: don’t confuse the audience, don’t go beyond the ordinary world. But then came the musical, which dared to break all tradition. Why are they singing? They are singing because they can’t help it, damn it! Why are they dancing? Same reason. But cinematically, a number of the great musicals still attempt to preserve continuity and a tradition of order. But not Vincente Minnelli, and certainly not in The Band Wagon. The Band Wagon is the ultimate musical to come out of the Arthur Freed unit, in many ways because its self-awareness about the limits of the frame. So take the moment I cannot stop watching over and over: during the film’s most recognized song, “That’s Entertainment!” there’s a moment where we see Oscar Levant carrying a long ladder across the screen, holding the front. And then we’re distracted by Nanette Fabray, before we return our eyes to that ladder, still going, and carrying from the other side is none other than Levant again. This isn’t exactly a ground breaking joke, and if pressed, I’m sure one could find a similar gag in earlier slapstick films. 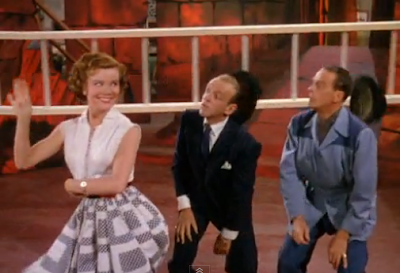 But Minnelli treats the gag with such irreverence, and it always works for me. That smile on Levant’s face as returns to the screen says it all: we’re having just as much fun as you, and we don’t care.